The Magnificent Seven (1960) is an American western film directed by John Sturges and the film's score is by Elmer Bernstein. Along with the iconic main theme and effective support of the story line, the score also contains allusions to twentieth-century symphonic works, such as the reference to Bartok's Concerto for Orchestra, second movement, in the tense quiet scene just before the shoot out. The original soundtrack was not released at the time until reused and rerecorded by Bernstein for the soundtrack of Return of the Seven. 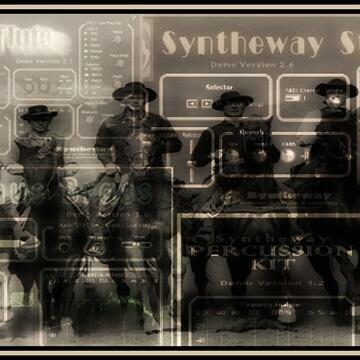 1.- Syntheway Strings VSTi is a sample based string VST instrument featuring a multisampled Ensemble Strings with Violin, Viola, Cello & Contrabass. 2.- Aeternus Brass VSTi is a Virtual Brass instrument, featuring solo Trumpet, Cornet, Trombone, Tuba, French Horn, Flugelhorn as well as Brass Sections and Orchestral Ensemble. 3.- DAL Flute VSTi Description: DALF is a virtual woodwind instrument combining multi-samples of real flutes with a Digital Signal Processing (DSP) engine. Offers control over several parameters allowing you to sculpt new and interesting sounds. Hybrid Synthesis that combines sample-playback engine with native DSP processing. Powerful multi-mode filters, envelopes, and LFOs give a wealth of creative possibilities. Flute Selector: Normal, Bright, Pan Flute (Panpipe) and Shakuhachi modes. 32 presets redesigned in a wide range of styles: 8 for each mode: Normal, Bright, Pan and Shakuhachi. 4.- Syntheway Percussion Kit: is a collection of percussion instruments designed for creating Orchestral, Auxiliary, Mallet, Latin, Indian and African Percussion. AU / VST Hosts: Logic Pro X, GarageBand, Final Cut Pro X, MainStage, Cubase, Ardour, Ableton Live, REAPER and Digital Performer OS: Apple Mac OS X v10.6 "Snow Leopard", Mac OS X v10.7 "Lion", Mac OS X v10.8 "Mountain Lion", Mac OS X v10.9 "Mavericks", Mac OS X v10.10 "Yosemite".